The news of layoffs at StumbleUpon reminded me that in compiling some year-end social media referral data I’d noticed that a number of sites had experienced declines in StumbleUpon traffic. To get a better sense of the situation I pulled StumbleUpon referral figures from 2010-2012 for a group of 47 news and content sites that we work with at Define Media Group, primarily magazine brands. The examined sites can be roughly divided into five main categories: food, home, fashion & beauty, health, entertainment and news & tech. For confidentially reasons I am not able to reveal the specific titles, but they are all well-known brands from major publishers. Many of the sites were also included in the comparisons I did last year on Pinterest traffic and Pinterest links. While this does not represent any kind of comprehensive analysis the number of sites and range of topical coverage does offer enough of a sampling to gain some general insights. Not every category has the same number of titles and some sites have larger audiences than others, so to keep the information both anonymous and meaningful I’ve used a combination of total and average figures for the group as a whole and the individual categories. One thing that is important to point out is that some publishers participate in StumbleUpon Paid Discovery which has an impact on their traffic figures. Participation, budgets and timing varies greatly for the sites in this group and I am not able to segment that in the reported data. StumbleUpon referrals are down 27% for the group as a whole, with each individual category experiencing larger drops than that. 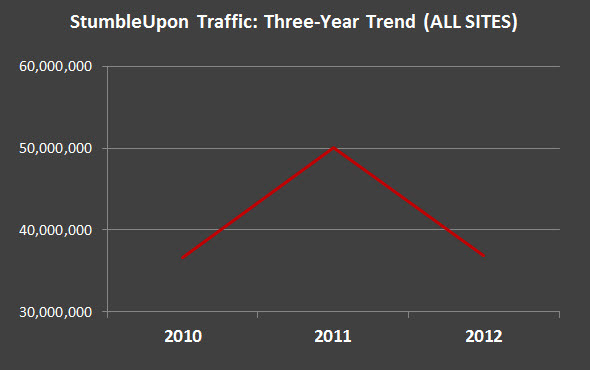 One thing to point out is that not every site experienced a decline in 2012. 14 of the 47 sites experienced a YoY increase of varying degree. 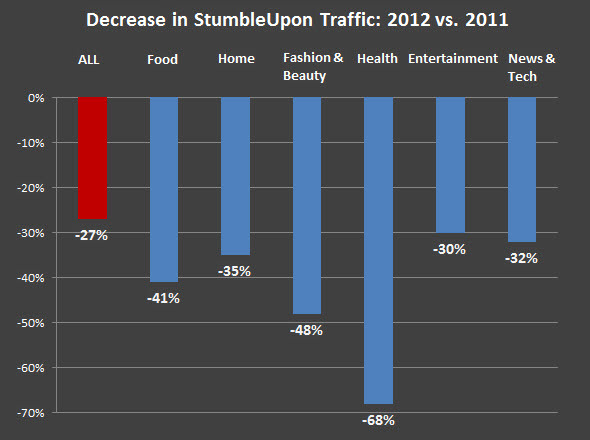 However that is a pretty small minority, especially considering that from 2007-2011 many content sites (not just the ones in this group) saw nice gains in StumbleUpon traffic each year. With that in mind I also pulled 2010 data to see if YoY performance for 2011 vs. 2010 had been better. 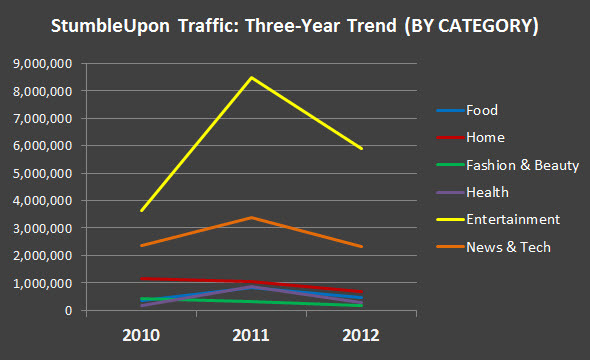 It had; only 10 of the 47 sites saw a YoY decline in 2011, compared to 33 in 2012. Grouped together, the home and fashion & beauty categories have experienced a more gradual decline over the past three years while the 2012 drop in the other categories has been more significant. If I backed this out a few more years you’d see nice gains overall gains from 2007-2010. I should emphasize that these results represent the experiences of the specific sites in the surveyed group and not necessarily other sites that cover similar topics. In addition there are exceptions within each group where a specific site has a much different three-year trend than the others. So what does the future hold for StumbleUpon? Has the rise of Pinterest unseated it as the preferred choice for browsing and discovery? Is the dominance of Facebook and Twitter, coupled with increasing Google+ engagement, proving to be too much? Personally I’m a fan of StumbleUpon both for users and as a source of traffic for publishers. StumbleUpon Channels and Paid Discovery are good opportunities to take advantage of, and I think their latest iPhone and iPad apps offer an excellent experience for non-desktop users. So hopefully StumbleUpon will continue to have success moving forward. If anyone has any experiences or data they’d be willing to share, it would be great to hear from you in the comments or please reach out to me personally.